Owning a high-quality trundle bed will allow you to save space in your bedroom. Instead of buying the traditional bed, you can opt for a trundle bed that could serve as a lounge in the morning and a cozy bed at night. With today’s modern technology, trundle beds can also be used by adults. Now you will never worry about your guest sleeping over your house or your limited room space. Allow us to introduce the top ten best trundle beds that you can buy for your home. This smart-saving trundle bed can be used for many years of sleepovers. With its twin-size daybed, a trundle, and two twin-size mattresses, it can accommodate your guests and friends. Metal slats support the trundle bed. It is built to last for a long time. When not in use, one can easily collapse and fit the trundle underneath the daybed. You can also lift it up, the perfect option for your children and sleepover parties. You can set the trundle bed in three space-saving ways. It depends on how you’re going to use it; it can serve as a lounge during daytime and a cozy bed during nighttime. This trundle bed has holes in front and bottom for the headboard and the floorboard. The buyer can enjoy up to 5-year warranty upon purchasing the product. Only mattresses are applicable for warranty. The Dream Solutions manufacture the first trundle bed on our list. It’s a great daybed that is supported by metal slats for reliable stability. This trundle bed is built to last. To save space, the trundle can be easily slid down beneath the daybed during the daytime. At night, you can easily lift the trundle. It’s an ideal bed if you have lots of kids sleeping in the same room or sleepovers to expect. When you open the trundle, two beds are of the same height. It’s a smart option for homeowners who wanted to save both space and money. 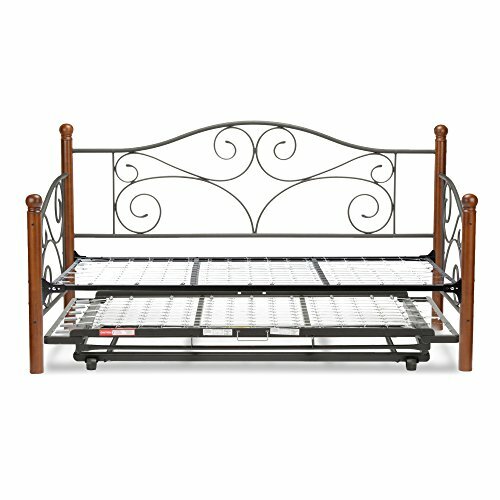 The metal trundle bed set can be used as a space-saving single by leaving the trundle rolled under the high rise frame. You can also roll the trundle out but leave it in down position. Or lift it up to the same height as your daybed. Both headboard and footboard can be attached to the bed. Issues with the mattress’ quality. 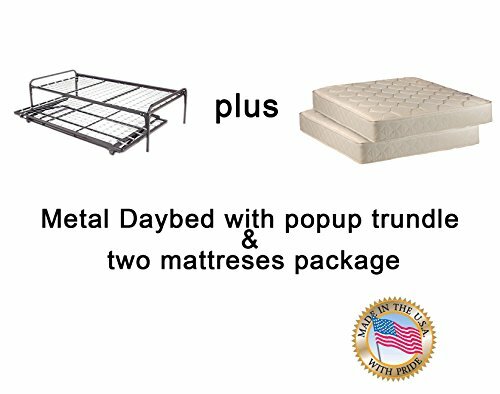 The Kings Brand Furniture comes with an all-new black metal twin size daybed with pop-up trundle and mattresses included. The twin-size bed is perfect for your children’s room and sleepover purposes. During daytime, you can tuck the trundle underneath the bed and use it as a sofa while watching TV or just hanging out. The mattresses are supported with seven metal slats for extreme stability. You don’t need any box spring or separate bed frame in setting it up. The cushion is soft and comfortable for a good night’s sleep and a spacious lounge. It can be easily assembled without accompanying. No directions for set-up included. The 2K Furniture Design had launched a new model of a trundle bed that every homeowner should consider. This daybed utilizes metal slats for supporting the mattress. The trundle is collapsible and can be fitted beneath the daybed when not in use. One can easily lift the trundle up without assistance. It’s an excellent option for children, guests, and sleepovers. You can leave the trundle rolled under the high rise frame, roll it out but in a down position, or lift it up the same height as the daybed. There are holes for attaching the headboard and floorboard of the bed. The assembly doesn’t require much time, and it can be done quickly by a person or two. The sturdy metal frame can assure the owner that this product may last for a more extended period. This twin-sized daybed provides the luxury of comfort whether it’s day or night. You can easily blend it with your existing interior design. The carbon steel panels with matte black powder coat finish is a head-turner. Aside from that, the scrolled metal spindles and four walnut hardwood final posts add to its elegance and durability. It is both stylish and functional. It will allow the user to feel as if he’s using a traditional was from the grills to the rustic Tuscan farmhouse decor. A 12-inch space between the floor and the daybed base stores the trundle bed pop-up frame that you can easily lift. The user can benefit from the 10-year warranty upon purchasing the product. The pop-up is hard to collapse. Bowery Hill had launched an all-new pop-up trundle for a daybed in an all-black coat. This elegant-looking daybed is easy to assemble and no other tools required! The frame is made out of metal slats, ensuring stability while using the product. It can be used as a sofa during daytime and pop the trundle out during nighttime. 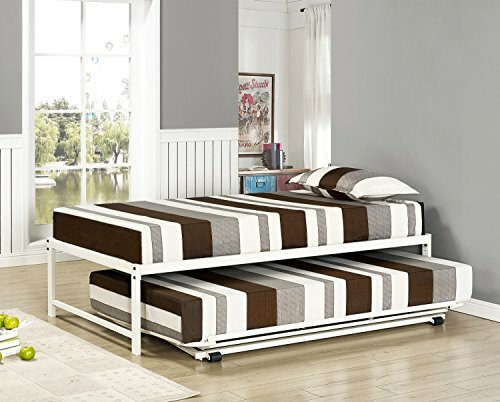 This space-saving trundle bed is great for your kid’s bedroom or sleepover purposes. The item weighs only 61 pounds, making it easier for you to move it around and transfer it from one room to another. Now you can have enough bed for your family without taking any space away from your room. 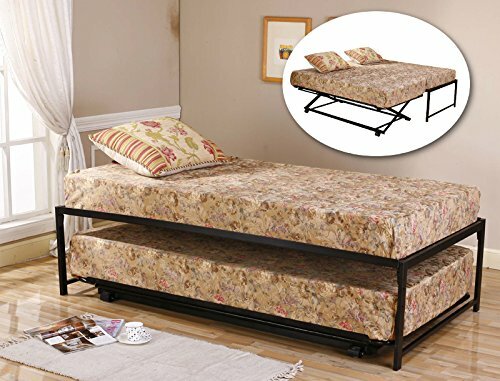 This metal twin size daybed frame with pop-up trundle is designed to provide comfort while making the most of the bed. The trundle can be quickly pulled out from underneath the daybed when you sleep and can be tucked inside during daytime to use as a sofa. The elegant metal design of the bed is great for any living room or guest room. It can also be placed in your children’s room. During daytime, it can serve as a sofa because of the two armrests and a headboard already installed. This model comes in black and white color, allowing you blend it perfectly with your existing house design. If you have a sleepover party coming up soon, take a look at this trundle bed by MRT supply! It can provide an additional sleeping pace inside a tight room. The package includes a twin size daybed, a pop-up trundle, and two 8″ twin size innerspring coil unit mattress. During the day, you can tuck the trundle underneath the daybed and use it as a sofa while reading a book. At night, pull it out, and it can serve automatically as a bed. It has seven metal slats for stability and excellent support. 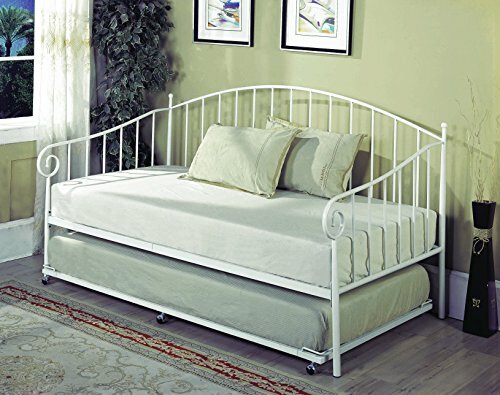 The trundle bed is easily assembled and does not require much time. Cannot be used as a full-sized bed. This cottage-style trundle bed is an interesting piece that can be added to your children’s living room. The metal frame that provides stability to the mattresses it coated and finished in white— offering an elegant ambiance. Also, link springs are included for easy assembly of the bed. Your children can use it as a sofa during daytime and roll out the trundle during nighttime for more comfortable use. It’s both stylish and durable, the best option for your kid’s bedroom. Costly for a trundle bed. Another product from the Kings Brand Furniture is the twin size daybed with a white-coated metal platform. 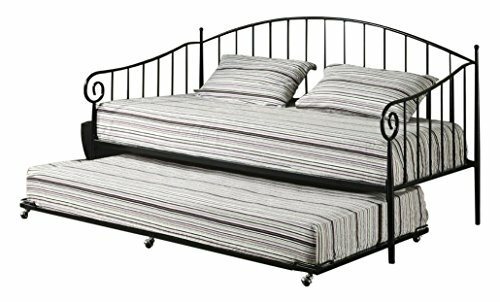 The bed is supported with metal slats and built to last for a long time. One can quickly pop out the trundle underneath the bed during sleeping time. 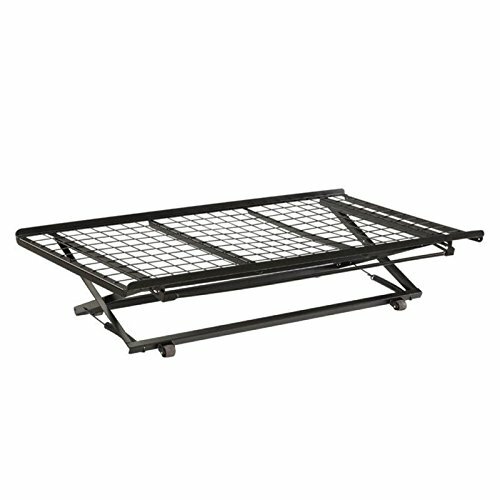 The frame is made out of all steel that can assure you the bed will last for an extended period. It’s the perfect bed for your young boys. You can quickly assemble the trundle bed with no accompany needed. Trundle is not the same height as the bed.